No-Bake Peppermint Cacao Energy “cookies” + My Holiday Tips! No matter what holiday you’re celebrating this season, it will most likely be filled with delicious treats and homemade meals. Of course, it’s important to indulge in your home-baked favorites and traditions, but it’s also important to find a balance of healthy, real food and sugary sweets. As you all know, one of my favorite things to do is remake recipes into healthier versions! 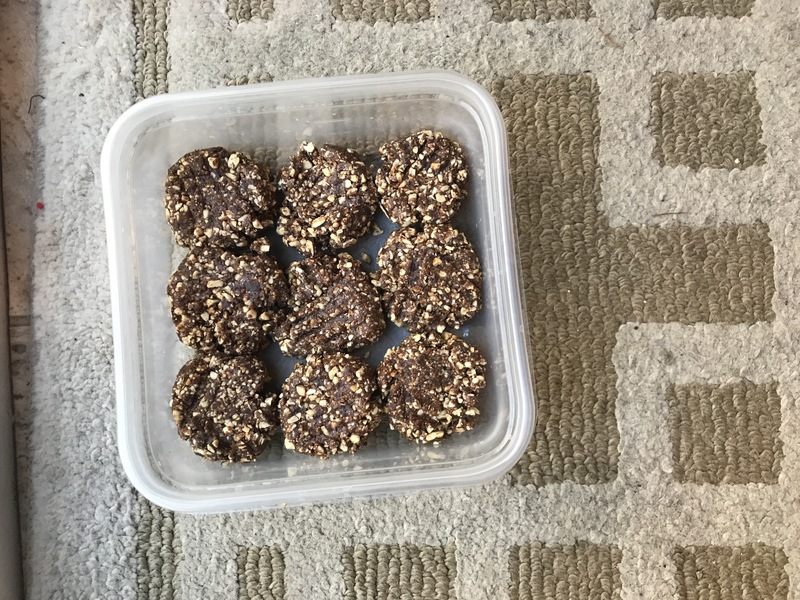 I also love homemade power bites and bars, such as my recipe for my favorite power bites or my apple cinnamon power bites on my blog! The other day, I was wanting to bake up a new kind of healthy recipe, so I decided to experiment with a cacao and peppermint version. Though this rarely happens, on the first try they were absolutely perfect! So, I had to share the recipe with you all. These bites can easily be rolled up, cut into bars, or be pressed down with a fork for a healthy cookie shape. They’re also perfect for a healthier treat to leave out for house guests (or santa :)). As far as my top tips for the holiday season go, I would be sure to drink plenty of water, because it is so dry this time of year and the water will offset some of that sugar (haha), make a healthy breakfast full of nutrients to start the day so that you start the day off with plenty of energy and vitamins (smoothies and avocado toast are perfect) and sharing your healthy creations with loved ones. When spending time with those close to you, it is a great idea to share some of your healthy inspiration and hopefully impact some of them! To begin, in a food processor combine the cashews and oats. Process until fine, and then add the rest of the ingredients. Blend until everything is combined, and roll into bites, cut into bars, or shape into cookies (about 10). Enjoy with friends and family!